The best way for most visitors to get around in Costa Rica is with a rental car. Typically tourists don’t leave the pavement and driving yourself is flexible, easy and often the cheapest option. A few remoter destinations may require an SUV and a sense of adventure and a few are only accessible by air or water. Transfers are a close second in price and convenience but lack some of the flexibility and freedom that comes with having your own wheels. Public buses are the transportation of choice for budget conscious backpackers on extended trips but typically eat up too much vacation time for travelers with only a week or two to explore. Somewhat surprisingly the bus can also be more expensive in some cases. Here’s a direct comparison of six transportation options on a popular route where the results are unexpected. Depending on destinations, budget, group size and length of vacation travelers also often take advantage of private transfers, tourist mini-buses, public transportation, small planes, boats, a ferry or taxis. A good answer to the question “what’s the best transportation?” requires knowing where you’re going. 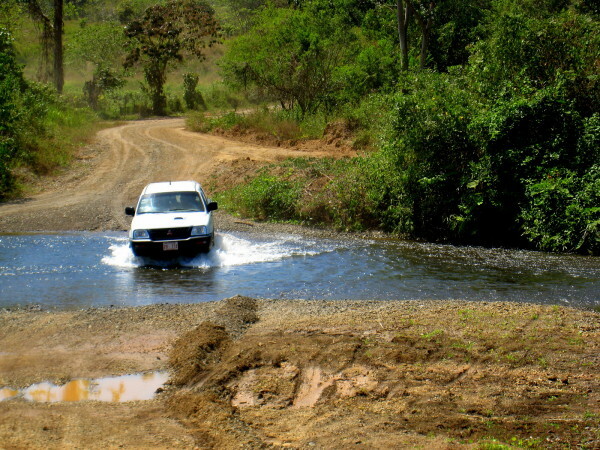 Trying to figure out whether you need to rent a four wheel drive or should choose a private driver, whether to budget for domestic airfare or if you can save time or money by using shared transportation is senseless until you know where you want to go within Costa Rica and what you want to do here. Find your hiking, biking, zipping, snorkeling, rafting and bird watching must see destinations first. Then look for the easiest, fastest, cheapest and most fun way to get there. After you have an idea of which locations you want to visit you can start trying to fit it into an itinerary and figuring out how to get around. If you have five weeks and a sense of adventure the public buses are great and very inexpensive. They can also be time consuming and quite inconvenient. If you’re only visiting for a week you’ll need a more efficient way of moving between adventures. Costa Rica is a tiny little country but don’t underestimate how long it takes to travel around it. Traveling a mere 100 miles between Corcovado National Park on the Osa and Gandoca Manzanillo on the southern Caribbean requires fifteen hours by road, three or four hours (with stopover) by small plane, or $3,500 for forty minutes in a charter helicopter. There are some very well worn tourist trails across and around Costa Rica and if you’re following one of these the ideal transportation is pretty well worked out. It could include a rental car, small plane flight, car ferry, private ground transfers, passenger launch, bus, shared mini-bus or even a horseback ride. The basic choice is between self-driving in a rental car and using provided transportation and the main factor in choosing is how and when you want your freedom. Every tourist destination has its problems with crime: pickpockets in Tiananmen Square, purse snatchers on motor scooters around the Roman coliseum, and theft from parked cars in Costa Rica. This leads to a situation that’s the opposite of what most people think. If you use provided transportation there’s the option of stopping at interesting spots along the way but if you’re driving a rental vehicle you can’t – if you do your luggage may be stolen. If you have friends who’ve been and you want to visit the same spots just ask them what they did and you’ll be right on track. If you’re planning a new trip read the suggestions above. You’ll have to decide what you want to see on this vacation and what you can miss. You can’t do it all in one visit. We’ve spent hundreds of days and more than ten thousand kilometers on the roads, shorelines, rivers and trails of Costa Rica and there are still dozens of spots we’re looking forward to seeing. We don’t own or operate a rental agency or transportation company so we’re free to suggest the most convenient, reasonable, comfortable and economical transportation to make your trip work. Give us a call and we’ll help work out a transportation plan. 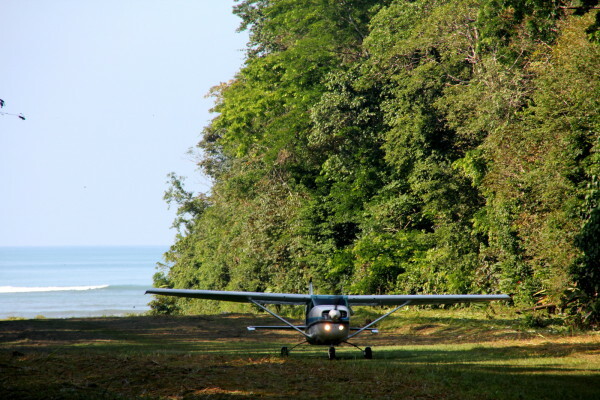 Some of the best tourist routes disappeared when one of Costa Rica’s airlines (Nature Air) was shut down in 2018 but there are a few destinations in Costa Rica where a domestic flight makes sense. Many flights although quick and relatively inexpensive don’t save much time. Layovers at the San José hub are frequently required and none of the outlying airstrips are particularly close to the hotels or resorts so you’re going to have to load into and pay for a mini-van or taxi too. You might have thought I was kidding when I mentioned horseback as a method of transportation but it can actually be a good choice. Monteverde and Arenal Volcano are only about 20 km apart but you have to drive almost a 100 km on very bad roads. There are several companies that offer a clever short cut across Lake Arenal that includes horseback or mountain bike riding on one leg (see other interesting boat routes in Costa Rica). There are many little tricks like this that combine transportation with a tour or activity and can make the experience much more interesting than driving. In fact one of our “Best Trips Ever” includes rafting, a motor launch on rainforest canals, and a flight that amounts to a sightseeing tour. All of the transportation is clever. If things don’t seem to be working out for seeing and doing everything you wanted you can try adjusting the transportation. Sometimes adding a flight can make sense. Or you can adjust your destinations. Just because Monteverde is the most famous cloud forest reserve in Costa Rica doesn’t necessarily mean it’s the best. There are half a dozen other world class cloud forests at least half of which are better than Monteverde in most ways. If you’re scheduling five hours to try to get to Monteverde look around your other destinations and see if there’s a cloud forest an hour from one of them. People often discover that they thought Costa Rica was easier to get around than it really is and many end up trimming off destinations. Two stops in 6 or 7 nights is probably good. Three can be done if they’re the right places. We’ve used a lot of different modes of transportation in Costa Rica and can say without hesitation that each of the following has been the best choice in certain situations – public buses, collectivo motorboat, mountain bikes, SUVs, walking, commercial flights, private shuttles, tourist mini-buses, car taxis, collectivo trucks, private bush planes, jeep taxis, horseback and rubber raft. We can also say without hesitation that unless you’re staying for several months and traveling to some pretty off the beaten path destinations your transportation choice will basically come down to either renting an SUV or riding in a van. Tourist Minibuses—These buses tend to be faster (an hour or so on a four hour trip), more convenient (door-to-door service to major hotels) and more comfortable (all promise A/C and some deliver) than the public buses. The biggest advantage is the direct routes on segments frequented by tourists where the public buses require going out of your way or changing buses frequently. Service frequency is increasing, but on many routes there is still only a single departure each morning. Prices range from $35 to $90 per person for shared shuttles (5 to 10 times the public bus fares) and $120 to $400 per van (total cost for 1-8 passengers) for private transfers. 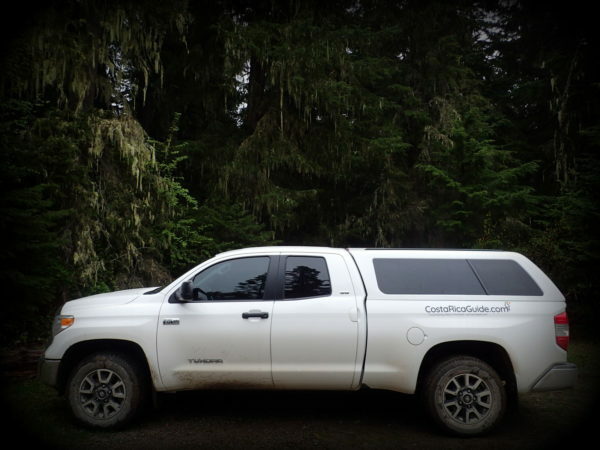 Rent a Car—Generally the most flexible way to travel, but if you don’t think you’ll ever spontaneously head to a little wildlife refuge you just heard about over breakfast then you may not need the flexibility. Our takes on the advantages and disadvantages of driving might help you decide. Tour Groups—If you’re an independent traveler this may sound like heresy, but one of the easiest ways of dealing with the complexities of transportation in Costa Rica is to just avoid the issue by joining a tour group. Public Buses—Often the cheapest mode of transportation for solo travel in Costa Rica. Buses range in price from around $0.90 to $18.00 and can be the fastest and most convenient method. Buses on the main routes are modern and comfortable but typically not air conditioned. Domestic Flights—Direct flights from San José are available to a dozen popular destinations at prices between $48 and $80 on two domestic airlines.